I am blessed with an amazing woman that consented to become my wife over 33 years ago. Among the many things we have in common is a fondness for beer, good beer! My fondness may cross over to an obsession for very good beers. As any good Catholic girl knows, Christmas is a time for Advent Calendars. FYI, Advent Calendars originate with the German Lutherans and has become common among most Christian faiths. How does an Advent Calendar fit in a beer blog you might ask? It was discovered in my wife’s Pintrest account. I have one but I am not quite that Pintrest savvy – yet! Ok, how is it done? She built a massive book case thing out of oak with little doors for each of the 24 Advent days. Each little door was large enough and deep enough for a 12 ounce bottle of beer lying on it’s side. All hardware was polished brass and finished natural with high gloss Tung Oil. Each little door was built like paneled doors and the edges rounded with a router. SMACK! Sorry I was dreaming! Isn’t that the coolest idea? 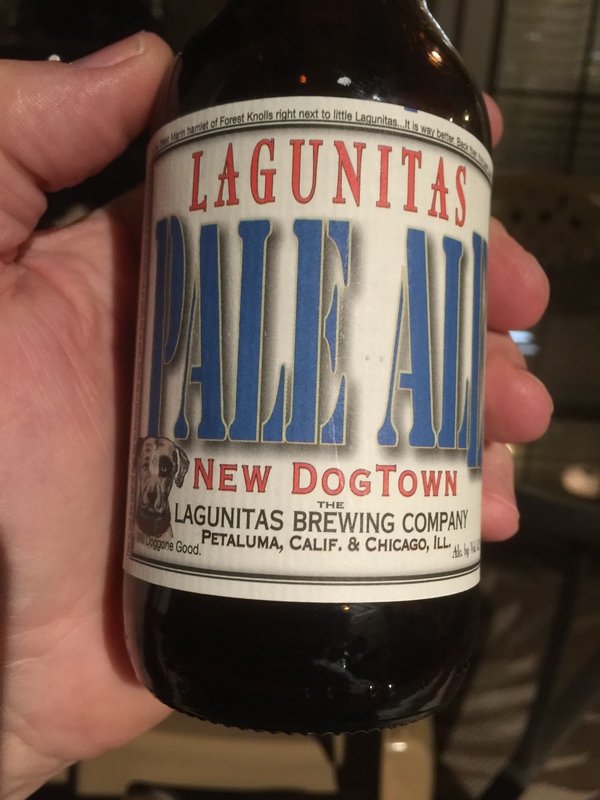 Today’s offering was from Lagunitas Brewing Company in Petaluma, CA. Hmmmm 1967 also comes to mind. Why? It is a story for another time, involves lifeguarding, beer, swimming, old friends and rock concerts! Great beer! Great aroma, near perfect bitterness. Love it! What a gal and what a gift! I had originally planned on a separate post for each stop but I wanted to keep my promise to the brewers and get the ball rolling. 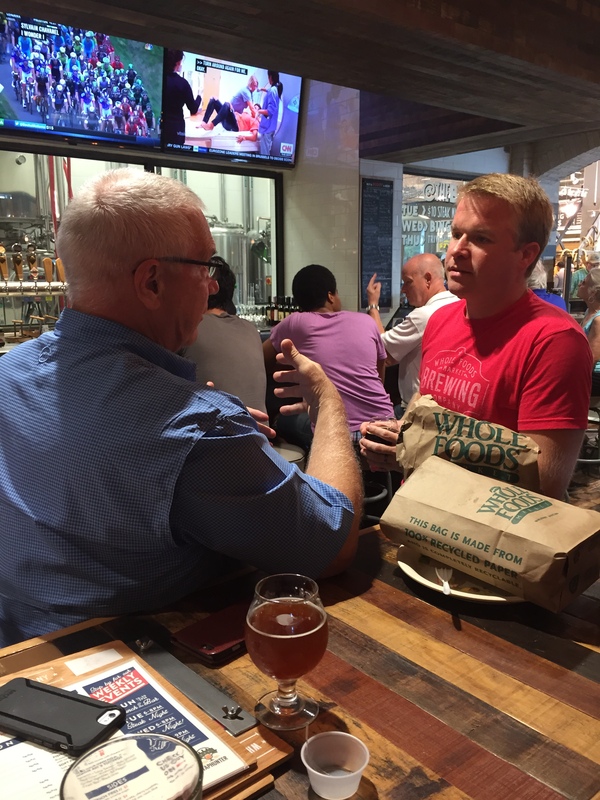 July 11th – Whole Foods Market, yes – Whole Foods Market – they have an awesome brewery in the store. The head brewer, Dave Ohmer, is the creative and driving force behind the efforts. I used the plural to reflect his commitment to continually brewing a new beer, never repeating. You will not find a flagship beer associated with the Brewery. If you find a beer you really like you better campout in the store and drink it until it is gone……because it ain’t coming back. The day we were there was a bit of a family gathering….and we all lover beer! Daughters, Ashleigh and Lisa, friend of daughter Ashleigh….and she really loves beer…..LOL….Don’t hold it against me Ferrin, I meant it as a compliment, my son and his GF Cheryl Again, another two beer lovers. Last and definitely not least my wife Kathy…..a beer drinker for a very long time…maybe even HS age when her older brothers would stash beer in the bushes in the alley behind the house for her. Hun, the kids are old enough to hear these stories now. Back to the Whole Foods story. We met for lunch, you can pick something up in the store and consume in the Brewery area or order off a menu. We did a mix of both. The day of our visit they had 12 house brewed beers on tap and a couple of guest beers. They variety and creativity is pretty amazing. A word to beer lovers, if you find one on the menu you like, carve out some time to continue drinking, come back often because once that batch is gone it will be only a memory! 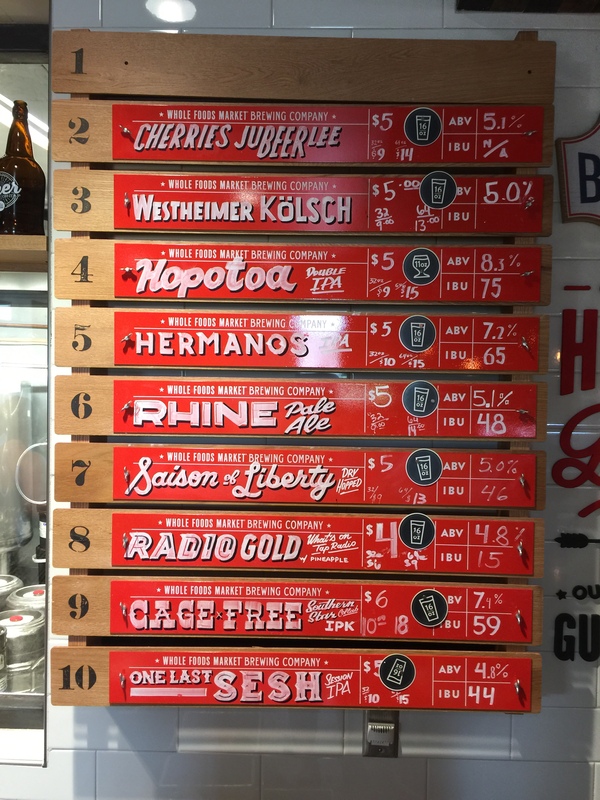 Ten of the twelve Whole Foods beers on tap that day. 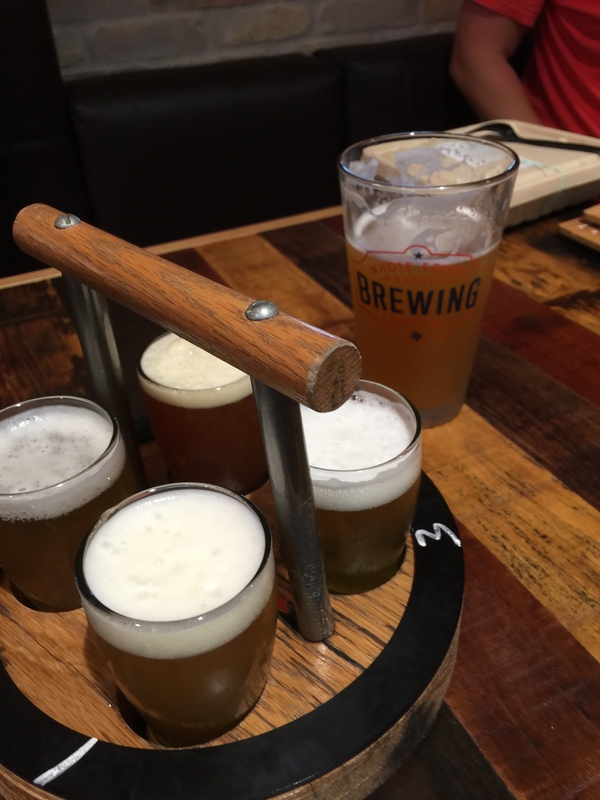 I got a chance to meet with Dave, the head brewer, and we had a 20-30 minute beer discussion…. 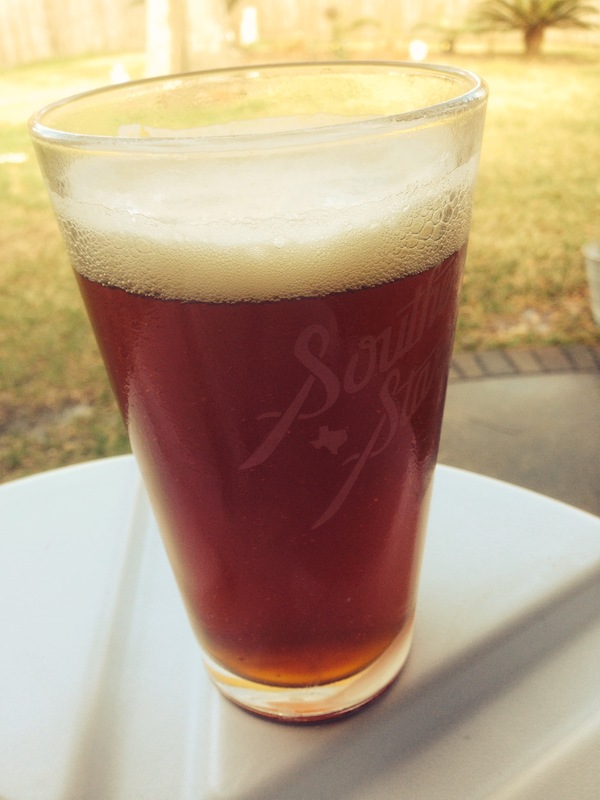 We are not beer nerds….I think we are a little beyond being beer nerds and definitely not beer snobs. We have a love for beer, brewing beer, enjoying new and interesting beers and love talking beer. 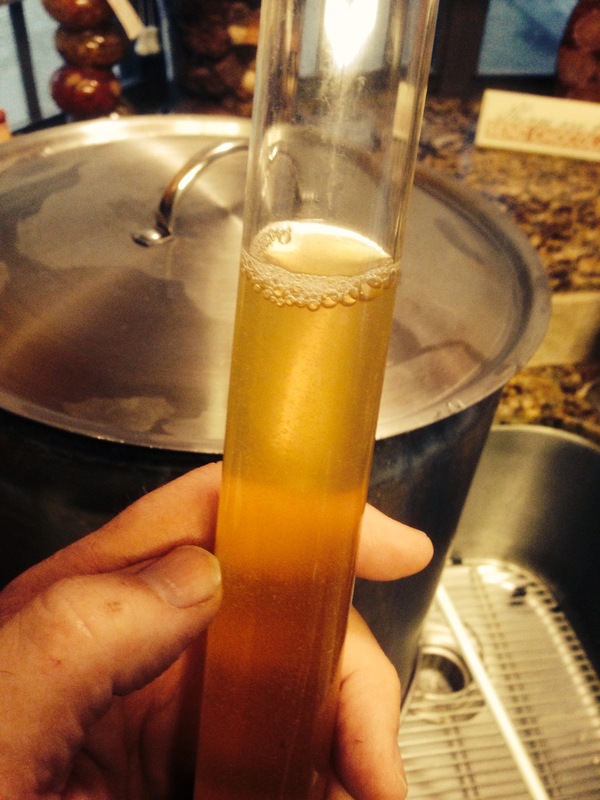 And talk we did….He has a deep background in brewing….from being the clean-up guy all the way to head brewer. Dave and me talking beer before heading into the back room. While in the back room on the other side of the glass he let me sample a Belgian made with smoked pears, pears from the store, smoked in the smoker on site in the store and then mashed up and fermented along with the rest of the wort. So danged good. I asked why they won’t have a regular group of beers and then do seasonal’s or trials of others? At this point in time he told me, their plan is to never beer brew the same recipe again….they will produce a similar style but every batch will be unique. 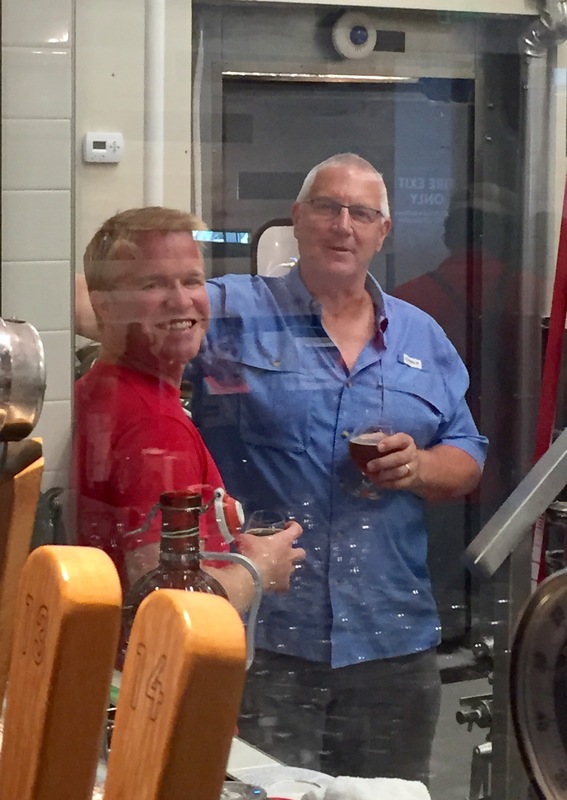 On the other side of the glass….great equipment, amazing brewing knowledge and a very creative guy! If you are local – head on over. Whole Foods on Post Oak near the Galleria. If you are in for a visit….well some people like to shop at the galleria – and if you are like me, you could hang out a Whole Foods until the other party has finished shopping….if there is such a thing as finished shopping. Be nice Bishop….it could be said that there is a similar feeling about beer sampling!